NEW YORK -- Authorities today were focusing on what caused a construction boom crane to crash to the ground at a Manhattan worksite, killing one construction worker and seriously injuring another. The dead worker was identified by police as Michael Simmermeyer, 30, of Burlington, N.J. He was pronounced dead following Tuesday's accident at the construction site of the No. 7 subway line extension. One other person was hospitalized in serious condition and three people were treated for minor injuries. The crane was set up on the second of three levels on the construction site on Manhattan's West Side, city officials said. The FDNY said the boom came apart in two pieces -- one 80 feet long and the other 40 feet long. The NYPD said that the investigation would be jointly conducted by the Department of Buildings and police. Jack Sullivan, deputy chief for the FDNY EMS, said it was possible one of the workers had been struck by the crane's boom. The crane operator and someone who worked with him were among those who were injured. He described the removal of the workers from the construction site, about 60 feet below street level, as "extremely dangerous." "We had construction material that wasn't stable," he said. Dozens of first responders came to the accident site. Standing on a sidewalk, one construction laborer collapsed in tears into the arms of another worker. A laborer could be heard saying: "I can't take it." Thomas Rushkin, a retired city police officer and private investigator, said he was on his way home when he saw emergency vehicles heading over and got a glance at the pieces of the crane. "The arm is broken in half," he said, adding that it appeared that one part of the crane was on a level below the street. Another witness, Kennon Murphy, of Charlotte, N.C., said he was on his way to the nearby Javits Convention Center when he heard "a big boom." He said of the crane: "We noticed it was down." The Metropolitan Transportation Authority released a statement saying they plan to work with all proper authorities to conduct a thorough investigation into the incident. "On behalf of the entire MTA, we pray for the recovery of the workers injured as a result of this tragic accident," the statement said. 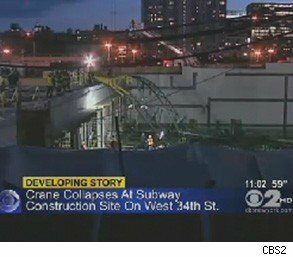 In May 2008, a construction crane collapsed on Manhattan's East Side, killing the crane operator and a fellow worker. The crane's owner is currently on trial for manslaughter.